We are what is called a Boutique Orthodontic Clinic. Dr. Shadmand sees each patient and spends quality treatment time with them at every single visit. Dr, Shadmand is a specialist in Orthodontics and she also holds a PhD degree in Bone Growth and Development. Every individual is unique and requires a unique treatment plan. Dr. Shadmand strives to craft the perfect smile that is unique to you, one that is beautiful, healthy and will allow your personality to shine! Orthodontics is not only about moving teeth around and aligning the front teeth. Your diagnosis and treatment plan involves a combination of art and science that takes into account your facial and smile aesthetics, your dental and oral health, your overall health and other specific needs. We offer multiple treatment options like early treatment, clear braces, clear aligners, lingual braces and combined Orthodontic/Orthognathic surgery. We strive to find the best option that is compatible with your lifestyle and budget and make sure you understand the advantages and disadvantages of each option. We make sure that you can afford the smile you deserve. Our fees are competitive and we offer flexible in-office payment plans that can fit in any budget. We understand that this is a big investment in time and money for you and we will work with you to find the best payment plan option that will allow you to achieve your dream smile. Our staff are friendly, knowledgeable and passionate about helping our patients. When you are a patient at Bradford Orthodontics you will always be listened to, kept informed and engaged, and fully supported throughout your treatment. We are conveniently located in the heart of the Town of Bradford on Holland Street. We have created a bright open concept office, filled with laughter and smiles. The moment you step through our doors you will enter into a relaxed and cheerful atmosphere, where you know you are welcome. 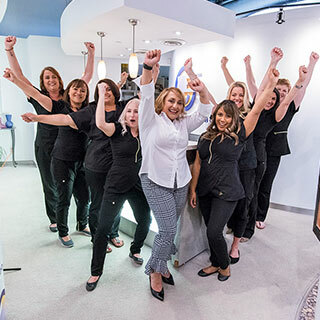 We employ the latest technology in the orthodontic field to provide our patients with the most advanced techniques and the best possible treatment results. Dr. Shadmand and our team are constantly attending various continuing education courses to stay on top of the latest technologies and advances in Orthodontics in order to improve our skills so we can treat you or your loved ones with outmost confidence. We follow the strictest protocols for bacterial control and sterilization and use hospital-grade sterilization in our office. We value your time and pride ourselves in being on time almost all of the time and we expect the same from our patients. Our team can communicate in multiple languages. Early morning and after-school appointments are available. Schedule your Complimentary First Visit today! Fill out the Appointment Request Form or Contact Us for more information or to schedule your complimentary consultation today! Our front office staff will greet you by name and with warm smiles, and that friendliness will continue throughout your Orthodontic treatment. While we truly enjoy creating smiles, we equally enjoy serving and getting to know our patient family!